Citigroup is trying to jumpstart revenues in its retail-banking business, and it thinks the company’s 28 million US credit-card customers represent a golden opportunity. Analysts and investors have been clamoring for more organic revenue growth from the global banking giant — which also has activist ValueAct Capital quietly working with the bank behind the scenes. Citi’s consumer bank, especially in the US, has been the focal point of frustrations amid stubborn revenue and deposit growth and efficiency that lags competitors. The bank’s US credit-card business has taken much of the blame — global cards chief Jud Linville departed in August amid a shakeup of the Global Consumer Bank — but it’s central to the bank’s strategy of juicing up sales in its $34 billion consumer division, according to incoming CFO Mark Mason. While the traditional US proprietary card business gained momentum in 2018, tapping that customer base for more opportunities represents a key revenue opportunity, Citi executives said at a financial conference Tuesday. Among Citi’s retail and business banking customers, 40% also have a Citi credit card. But a slim portion of Citi’s branded credit-card customers have a banking relationship — penetration is in the low single-digits, Mason said. Given that Citi has the second-largest card network in the US behind JPMorgan Chase, mining its 28 million US branded cardholders for other business relationships could translate into big money for the bank. "If we could just penetrate a small percentage of that card base with retail banking activity, that, we think, creates a significant opportunity for us, and one we’re uniquely positioned to take advantage of," Mason said. 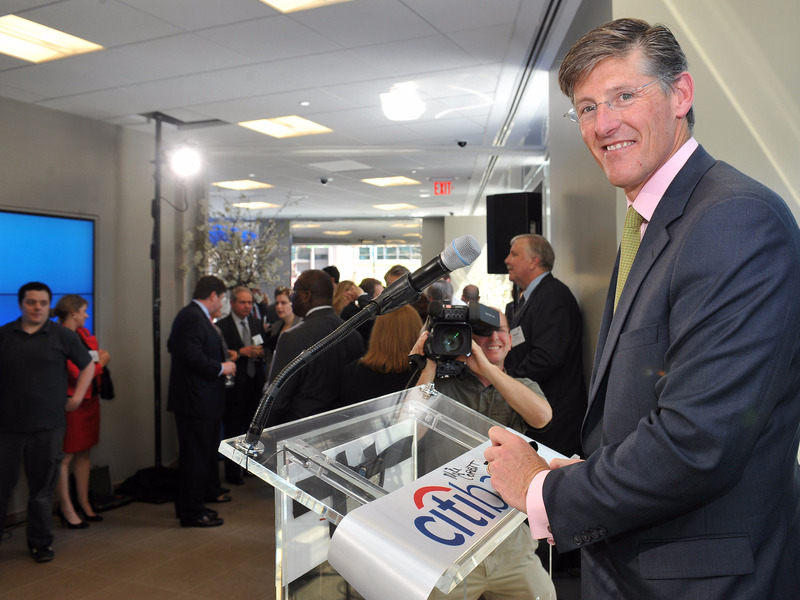 See also: Citigroup has invested in nearly 50 startups including Betterment, Tanium and Plaid. Here’s how the giant bank’s innovation chief decides which to invest in. The consumer-bank facelift in August was in part in effort to mold its US business — which previously had been siloed by individual product lines, such as mortgages, banking, and credit cards — after its consumer presence in Asia, which takes a more holistic customer approach. Employing the "client-centric model" to the bank’s massive US customer base "affords us an opportunity to tap that asset of ours and develop value propositions that are appealing to that," Mason said. For instance, if the bank can make banking customers out of a larger chunk of those cardholders, the bank’s deposit base — which was flat from end of 2017 to end of 2018 — will inch higher. The strategy for converting those credit-card customers involves, in part, rolling out new digital products and services, Mason said. For instance, the bank is piloting a flex-loan product in which cardholders can digitally transfer part of their credit line to a fixed-interest rate and fixed-payment loan. The bank is also testing high-yield online savings accounts in some markets. "We see good response early on. And so we’ll continue that through the course of the year, and then we hope to see some of that start to take off more meaningfully," Mason said.